Infiniti has been teasing the Q80 for a while, and now that they've finally dropped photos and specs. It's not only beautiful, it's realistic to think it might make it to production, at least in some form. Designed to showcase Infiniti's near-future design and engineering direction, it's set to compete at the highest levels of BMW and Mercedes luxury. 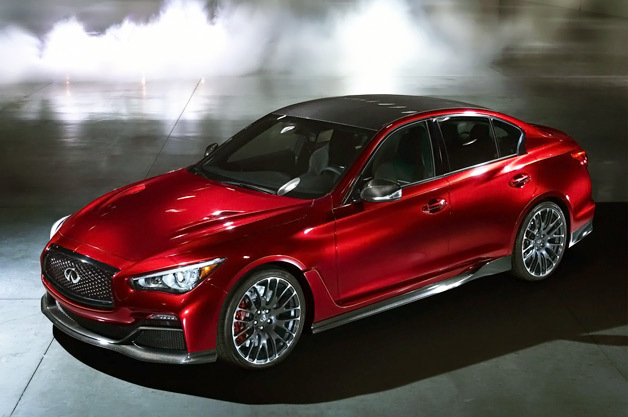 And with 550 hp, the Q80 competed at a very high rate of speed. It's a four-door, and at nearly 200 inches, it's roughly the same length as BMW's 7 Series, though with the heat vents in the fenders and that gorgeous swooping fastback profile, it's visually much more like a Porsche Panamera. Either way, this represents a huge change for Infiniti's design philosophy. Beyond saying that the Q80 is powered by a 550 hp twin turbo V6 that's part of a hybrid drivetrain, Infiniti isn't giving away much about the car's engineering at this point. Given that they've been very publicly developing the similarly (but non hybrid) powered all wheel drive Eau Rouge prototype, though, there's a very real chance that it's designed to put power to all four wheels. Normal front doors, coupled with suicide rears reveal a pillar-less view into the interior, which, at least in this early concept form, is strictly a four-seater thanks to a pair of deep bucket seats in back. The all-glass roof serves two main purposes: it keeps the interior full of natural light, and it looks stunning, even if there's little chance it sticks around for the final design. Inside, most of the information you need is posted on the car's heads-up display, which keeps the need for a busy dashboard to a minimum. As for the rest, it's nothing but brushed aluminum, leather, and Alcantara. If the Q80 Inspiration is meant to preview Infiniti's upcoming full-size luxury sedan's emphasis on style and speed, then it's a job well-done, and surely will surely warrant a very close look from a host of German designers. Aaron Miller is the Rides editor for Supercompressor, and can be found on Twitter. He has no idea why the exterior shots of this car look like they were filmed inside a clamshell.